Discussion in 'Magazines' started by MDNA, Jan 5, 2016. Ahh it reminds me of their inaugural cover! Beautiful! Two stunning and amazing women. Although, it's too orange. Someone went a bit overboard with the saturation scroll. Their normal skin tone would've made this even more perfect than it already its. Hhhmm, interesting! When last have we seen Anja looking this great on Vogue. Love the shot. Everything looks the same colour...hair, skin, dress, but I suppose this was the intent. Back to back Chen Man, wonder if this means she's out at HB China. 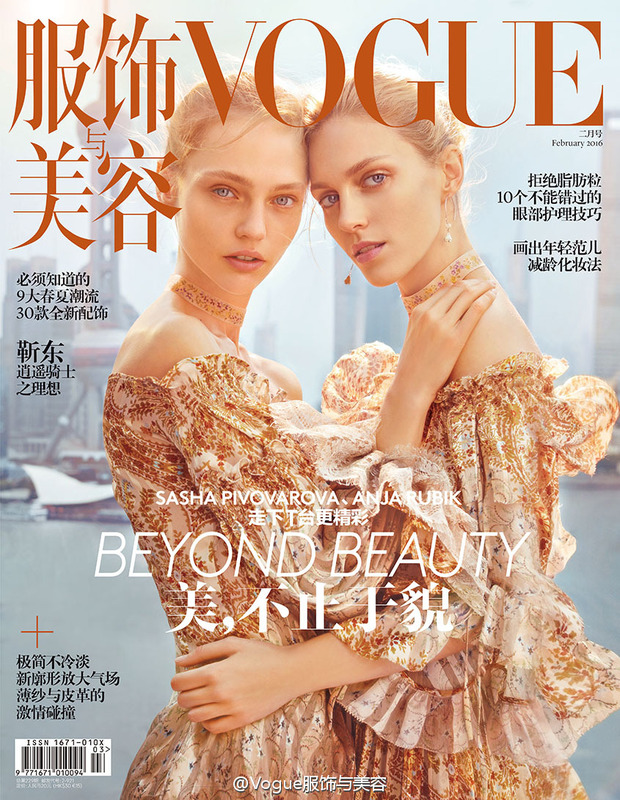 Nice cover but this one reminds me to Vogue china cover with Karlie and Patricia Van der Vliet. Stunning cover! Sasha and Anja both look so gorgeous! It's very beautiful! Both them look so stunning! They look a bit sick to me. Not a fan. They are a little too orange for my taste but other than that it is a beautiful cover. What a gorgeous cover, the light is just perfection, they look angelic. Chen Man is always a great welcome for them, her covers are great! It's also great to see Chen Man for VC again. They look so young and pretty. That eye makeup is some Snejana realness though. The eye makeup is maybe too orange but they still look very young and gorgeous. I´m thrilled for both of them and I think they look lovely but I wish the cover wasn´t so monochromatic. Literally the casting is spot on! This cover is so refreshing, Sasha and Anja always remind me of when I first started reading Vogue avidly. I'm really excited to them together on a cover. Well this is quite frankly an awful cover. I mean, Anja and Sasha are great models but the lighting is so off. Why are they so yellow compared to the background? It's unreal and it reminds me of this Kate Moss Vogue Japan cover, one of the most horrible covers ever. Chen Man hasn't impressed me with her photography yet even if it's good to see a Chinese photographer. ^^^ At least the VJ cover shot has a white seamless which still looks natural despite the hyper-stylized lighting. This just looks cut-and-paste, trite and juvenile. Chen Man is a terrible photographer. Is she from a powerful family in the publication industry, thus her unrestrained reign of unleashing awful fashion imagery? Mert & Marcus is heaven-sent next to her shots. She is strongly contributing to the American Vogue-ization of a once impressive publication. It's a beautiful cover but I don't care for the background or maybe I just don't understand the relevance between the two. Either way, both girls look lovely. Nice to see the softer side of Anja now and then.